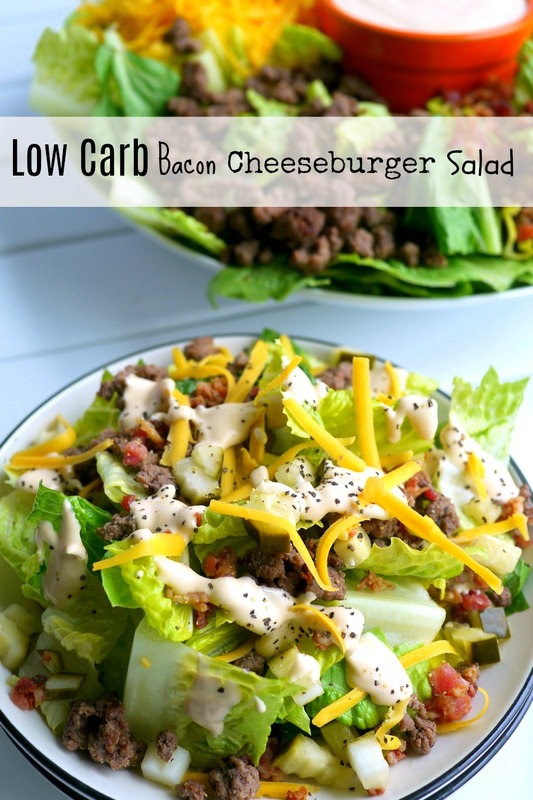 If you are trying to cut sugar out of your diet, this Low Carb Bacon Cheeseburger Salad Recipe is the perfect meal for you. Who needs the bun anyway? You’ll be surprised how much this flavorful salad mimics your favorite burger. A gluten-free, keto-friendly meal that makes a healthy lunch or dinner. My whole family loves this salad. Not only does it have the perfect crunch (hello dill pickles) it is packed with flavor between the bacon, ground beef and cheese. And the dressing has no added artificial sweeteners, which I tend to shy away from anyway. In fact, this salad won’t taste like anything low carb, it’s just delicious. I have made lots of “cheeseburger” flavored meals in the past and we still love them. Have you ever tried my Cheeseburger Mac and Cheese or my Roadside Diner Cheeseburger Quiche? They are definitely not low carb, but are so delicious. And speaking of delicious, these Cheeseburger Fillo Squares with Copycat Big Mac Sauce get made frequently for game day. You can’t miss with any of these recipes. However, for weeknight eating, this salad is the perfect meal and let’s me save the “bad eating” for the weekend, when things like sugar don’t count. Right? What I like about this salad is I don’t have to mix it altogether if I don’t want to. In fact, I often make it and keep the individual ingredients separate. This allows me to throw together a portion at different times of the day. Keeping ingredients separate also helps if you have a household where everyone is on a different eating schedule or you want to pack some up and take for lunch on the go. It’s versatile either way. Give this salad a chance and make it for dinner this week, I think you’ll like it. Looking for other healthy weeknight meals, here are some of my favorites. A month rarely goes by that I don’t make this flavorful Caprese Skillet Chicken. These 30-Minute Weeknight Veggie Quesadillas are the answer to my easy dinner prayers. This Healthy Turkey Bolognese keeps the calories in check. Have you ever made Ground Chicken Lettuce Wraps? It’s time you do. They are perfect for a weeknight meal. This One-Pot Chili Lime Chicken and Quinoa is healthy and delicious without a big mess left to clean up! Five years ago I posted about this Cucumber, Tomato and Chickpea Salad. It only has one-ingredient for the dressing and that’s all you need. Eight years ago today I posted these Mini Baked Cheesecakes with Strawberries and I still make them for my family. So easy! Nine years ago this Couscous Fruit Salad became a favorite dish to take to a gathering. This sounds delicious! I am going to give it a try! But with ground turkey, I cannot eat beef. Enjoy it. That will save you some calories too. It’s a shame . Your salad looks terrific, only one problem. Romaine lettuce! With ecoli running rapid it puts a damper on eating salad . I’ll wait until the scare is over and then I’ll make it for sure. Use a different lettuce for now. 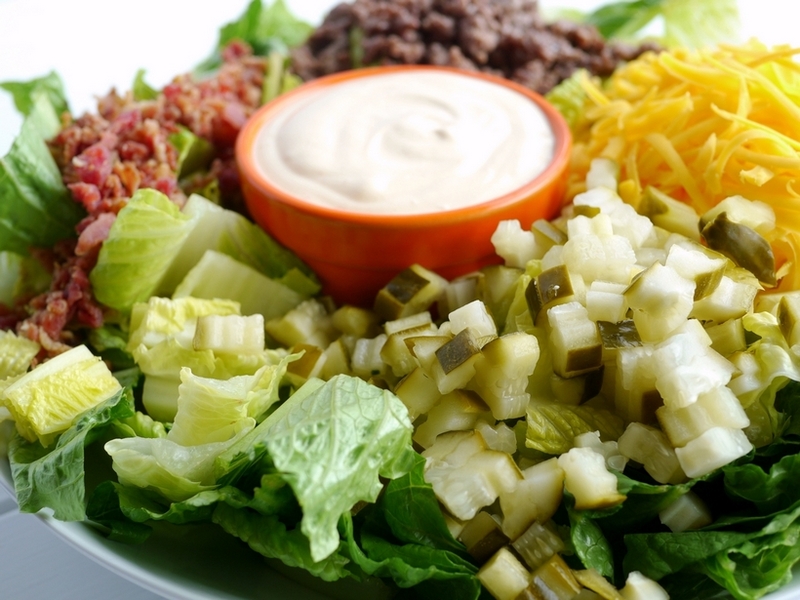 This is very similar to a salad served at Black Bear Diner and they call it Cheeseburger salad too. My wife and I are on the keto diet and this is our go to meal when we eat there. Is their recipe keto friendly? Clever idea! We rarely eat a burger with a bun anyway anymore and eat kinda a deconstructed burger with “fixins” on the side. I like the salad concept. Looks good! Will try it. Yeah, Romaine off limits for now, but other lettuce/kale/spinach would be good too! My family would love this! This is so brilliant I can’t stand it, I Iove the little chopped pickles in there! Romaine affected is from Arizona . Do not think all romaine is affected or the stores would not be selling it. Yes, lettuce from Yuma, AZ.